Gift cards are great to give and fun to receive for birthdays, Christmas or just as a "thinking of you" card and each card will make a real difference to a child or young person in The Gambia, West Africa. The gift cards will be posted to you or the recipient of your choice. You can either click on the link to pay online or post a cheque to SSS, Brewery Arms Cottage, Stane Street, Ockley, Surrey RH5 5TH and include the details and address of who you would like the gift card sent to. Sports equipment such as footballs, nets, basketballs and hoops. A pack containing chalk, exercise books, pens and pencils. A one month salary for a nursery school teacher. 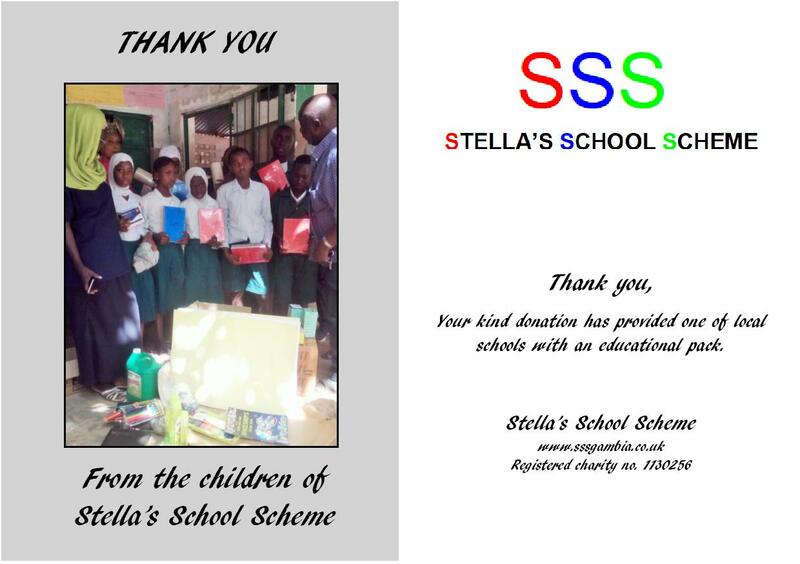 Sponsoring a child for a whole year includes school fees.